I’ve had the unusual privilege of experiencing three early years theatre shows in one week – how exciting! Being the glutton that I am for hunting down excellent quality work, I had high expectations and wasn’t at all disappointed by any of the three pieces I saw. This is the final one of three reviews, highlighting some of the key features of the magic of early years theatre. So grab a coffee and your diary in case you want to book your own private viewing! Based on Handel’s opera, Acis and Galatea, the Spitalfields team waved their magic to transform the piece in to a sensory wonderland for babies and toddlers under two. 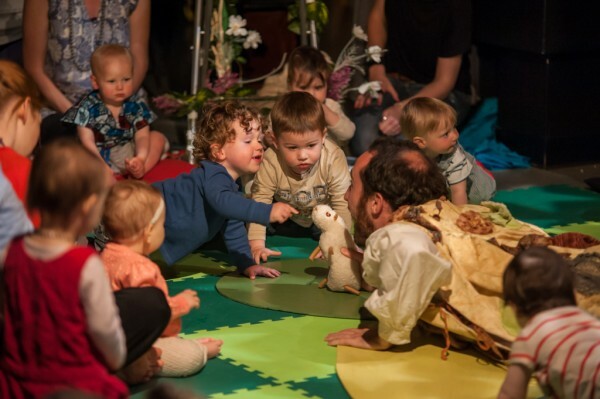 Taking a very different approach to creating work with or for babies, this interactive-opera really challenges traditional beliefs about what or who opera is for. Having so many under two’s all in one place enabled us to witness a range of stunningly honest reactions and responses to the music and singing, which were on the whole very positive - a powerful indicator of the success of the piece. A comfortable environment was established from the start with all singers and musicians interacting unashamedly with babies and parents alike, mostly sitting with the youngsters on the matting and cushions at the same level, and offering friendly eye contact in the hope to catch a glad eye wherever they could. The intention was to consider all audience members as sheep in the story, and therefore the performers responded to them as they would any other character on stage – with total inclusion. So, despite the Mountain Giant (floor-shaking bass, Oliver Hunt) entering with such a boomingly deep voice that I thought was bound to cause a few tears, he quickly positioned himself with a smiling singing face, lying down on the mat, lower than most of the babies there and, like a dog rolling over to offer up his tummy for a tickle, he established a playfulness that quickly dissipated any remaining threat. This set the scene for a much more relaxed group of parents (and therefore babies) which led to the youngsters becoming more independent of their carers, responding positively through physical and verbal reactions to each sensory experience, and not showing any signs of anxiety at the strangeness of the performance or venue (compared to, say, normal life at home). This excellent start was built on as the Water Nymph (spine chillingly beautiful soprano, Ruth McElvanney) entered with a beautiful dancing voice and flowing movements, spraying rain on all concerned and extending the sensory stimulation from the audio to the sense of touch. It struck me as a perfect introduction to the opera as far as engaging with the way very young children learn through their senses. The story then flowed through a series of activities that reflected elements of the story itself, including animating a river using stretchy fabric, making footprints using colour pigments, creating textured sound through the scrunching of paper and rolling of trumpets, the tactile rolling or construction of (polystyrene) rocks from the mountain, waving ribbon and paper flags, and chasing bubbles. Not one of the senses was left out as babies and toddlers were invited to play through whatever medium suited them best, and it was super to see the performers being careful not to offer more than one sensory activity at the same time. Clearly a great deal of research and thought had gone into creating this production. It could have been my keenness to try and observe as many babies’ responses as I could possibly process in one go, but I couldn’t help feeling that, as each activity led to the next, the story being sung became slightly overshadowed by the increasing sensory stimulation. It was clear from the number of babies now expressing themselves quite vocally and physically that the dynamic was changing quite quickly from one of calm intrigue, through excited playfulness, to one of overload and uncertainty as to what to do with all these opportunities. The opera had been wisely limited to 45 minutes, but perhaps even that was too high an expectation for babies and toddlers to remain focussed on the music above all else at such a tender age. At one point towards the end of the opera, I was struck by the energy being spent by the cello player perhaps in an attempt to put the music back into pole position within an increasingly chaotic scene. As a parent of two youngsters, I had no problem with the noise levels, and could still distinguish individual children’s contributions. But it occurred to me that this might have been a great opportunity for the musicians to sense and change the dynamic of the space with the skills and instruments at their disposal. No doubt this is exceedingly hard to do within a set piece – a piece adapted especially for the Spitalfields Festival around the desire to create a beautiful, musical environment for very young children. And I felt without a doubt that this was achieved superbly. In talking with the Director of Learning and Participation, Clare Lovett, I discovered that their intention in developing this work is to include more stillness and spaces just to be with the music, to enjoy its serenity as well as its exuberance and joy, and for the children to be able to respond in their own time before being taken on to the next activity. It is wonderfully refreshing to watch a company develop so keenly its understanding of its audience – especially when they are all under two! It was very clear to see that the quality and richness (in tone and style) of the music being performed elicited a quality of response from these children that I would not normally have witnessed in response to, say, a pop tune played on the radio. This is a complex arena in which I am not an expert, but I would suggest that the combination of live music, using period instruments (and therefore a very different, richer tone to modern instruments), an open and comfortable (secure) space on one level (i.e. the children’s), a beautifully crafted opera with some gentle but emotive phrasing, a well thought-through variety of open-ended, inclusive activities, and the engaging nature of each and every character in the show made this a very special experience for the babies and toddlers concerned which thereby elicited a very special response. Not surprisingly, there was very little crying to be heard until near the end, when sensory stimulation had reached its limit for a couple of tots. It was lovely to see the entire experience so well thought out as a whole. From understanding babies feeding and sleeping routines (not that any two are the same), the appropriate length of time for little concentration spans, the need for physical comfort as well as emotional security throughout, and the desire to ensure parents were as happy and relaxed as possible by inviting them to let their children play right from the start, this piece was a superb example of how to enabling very young audiences to relax and engage. In so far as the original challenge goes – I would say that this production provided clear evidence of why opera can be for babies and for playing with, as much as it can be for adults and for taking seriously. I thoroughly enjoyed such a refreshing take on a traditional art form, especially enjoying so many babies’ positive responses in one space. This was the final week of Musical Rumpus on tour so I am very much looking forward to seeing what comes next from the thoughtful minds of the Spitalfields Music team. More information here: http://www.spitalfieldsmusic.org.uk/get-involved.